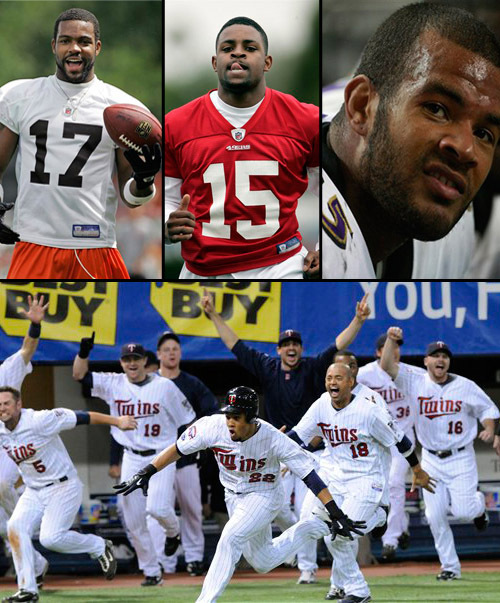 -ESPN’s Adam Schefter is reporting that the Browns have traded wide receiver Braylon Edwards to the New York Jets. In return, Cleveland gets wide receiver Chansi Stuckey, special teamer Jason Trusnik, and two draft picks. The trade comes just two days after Edwards was accused of assaulting a friend of Cleveland Cavaliers superstar Lebron James outside a nightclub. Edwards was the third overall pick of the 2005 NFL Draft. -Schefter is also reporting that wide receiver Michael Crabtree, the only first round draft pick of 2009 that hasn’t signed with his team, now apparently has. Crabtree was drafted 10th in this year’s draft by the San Francisco, but missed all of training camp and the 49ers’ first 4 games due to a holdout. He is expected to report to the team’s facility later today. -On a sad note: Tony Fein, who was a linebacker for the Ravens during the preseason, was found dead in Port Orchard, Washington yesterday. His agent said there were no immediate details available. -And what a baseball game last night! The Twins and Tigers were tied atop the AL Central after 162 games. And in baseball’s third tiebreaker game in as many years, it was Minnesota who prevailed 6-5 after 12 endless innings. In the top of the 8th, Detroit’s Maglio Ordonez hit a solo shot to tie the game at 4 apiece. Each team scored in the 10th, and then Alexi Casilla drove home Carlos Gomez in the bottom of the 12th. The game lasted 4 hours and 37 minutes. The Twins have little time to celebrate though; they begin Game 1 of the ALDS against the Yankees tonight at 6:07.